Jon Stewart made his final appearance as anchor on “The Daily Show” this week amid much fanfare and tears, although I don’t think the tears were from anybody at CNN or Fox News. There was more than enough praise, too, much of it earned. Stewart combined stand-up comedy with ruthless analysis of political events. I don’t know how successful he would have been at either one without the other, but he offered something different that balanced entertainment and journalism. As I went through YouTube videos of past shows, I got the feeling that he was a funny guy who worked hard at his craft. But then, of course, there are a lot of funny guys in New York. What made Stewart so special that he had become a media celebrity and the subject of articles like Rolling Stone’s “How Jon Stewart Changed The Way We Talk About Politics on TV“? I was reminded of an interview I saw years ago with Sammy Davis Jr. in which he acknowledged being funny but was sure there was “some cat in a garage in Cleveland who’s a lot funnier than me.” The comment struck me then and still does today. Why was that “cat” working as a mechanic in a garage while Sammy D was living it up with the Rat Pack in Las Vegas? What was the difference? Psychologist James Flynn may have an answer. He writes about the human capitalization rate, which is the rate at which a community capitalizes on the talent within it. So, for instance, if you grew up in Cupertino in the 70s-80s, you were surrounded by technological innovation and stood a good chance of benefiting by it, either in education, career, or investment. This was especially true if your parents were university professors. So, the environment you grow up in is extremely important in determining how successful you will be. No surprise there. But there’s more. As the old saw about Carnegie Hall goes, it takes practice to reach your full potential. How much practice? According to Malcolm Gladwell, about ten years of nearly eight-hour days, five days a week. This is true no matter how gifted you are. It took Mozart and Einstein that long. They may have started earlier, especially Mozart, but they had to go through the same learning curve (Einstein’s was warped). But times have changed and people are living longer. It isn’t a matter of establishing a career by age thirty anymore. We now have multiple careers, reinventing ourselves over time depending on the demands of life and our internal clocks. It’s also true that if you are in midlife or older, you may not have the time or desire to start over again. After all, who wants to be a novice at sixty? Enter Christopher Columbus. Whether you admire him or revile him, there’s no getting around his importance in human history and, as it turns out, human capitalization. He took the equivalent of Gladwell’s ten-year model, which in the mid fifteenth century consisted of a land route to China, and turned it on its head. Up till then, most people had thought in terms of land travel. But what if the time, expense, and peril of overland travel could be reduced by as much as half? Columbus’ idea was to find a quicker, more efficient way of reaching China by sea. The fact that the Ottoman Turks had conquered Constantinople and shut down the Silk Road made this imperative. By way of analogy, what if, instead of ten years, it took half that time to develop human potential? Is it possible to develop a “sea route” to success? I think so. Why? Because the greatest obstacle to mastering anything, whether the seven-string guitar, Mandarin, the Argentine tango, or finding a sea route to China is not the actual content. Of course, content is important, but it is not the determining factor, not by a long shot. Then what is? Rather than put it in terms of persistence, which you see all the time on Facebook and Twitter, I like to think of it negatively. That is, it’s a matter of not getting discouraged, walking off the set, ripping the canvas, or setting your manuscript on fire. It’s a decision you make every day not to let the stupidities of life and your own limitations, physical or otherwise, tear you apart. It’s about conquering yourself. I’m sure Jon Stewart and Sammy Davis conquered their fear at a certain point, which is possibly what the guy in Cleveland did not do. Columbus, either through stubbornness or genius–perhaps both–decided not to let his detractors have the day. The beauty of this is that once you conquer your fear in one area, it becomes that much easier in other areas. You are the common factor in every endeavor you undertake. I have no problem believing that pinochle sharps could teach ethics compliance without much trouble. How do you think I get by? Haven’t had enough? Check out books, Web site, Twitter. Look for Nine Lives this fall. Note to self: People are never in a hurry when you need something. 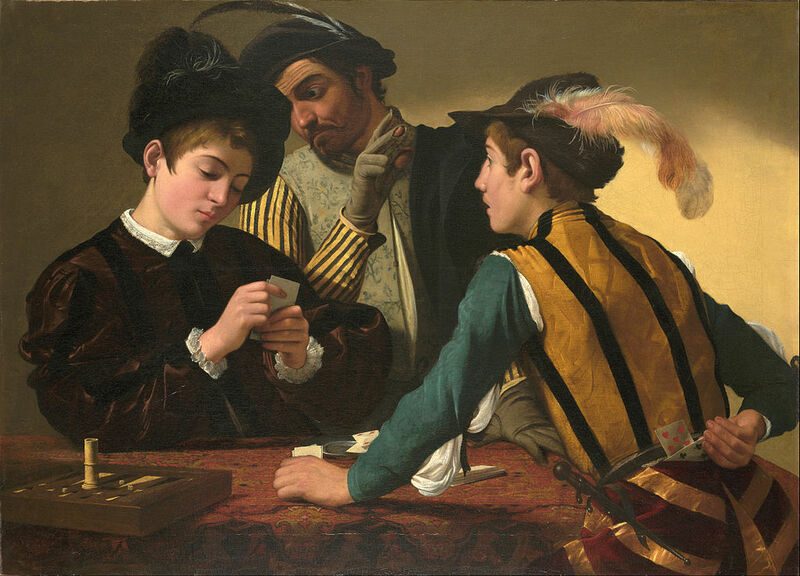 For top image, go to Frontiers of Anthropology; for middle Toscanelli map, go to Heritage: Newfoundland and Labrador; bottom (Cardsharps by Caravaggio, Michelangelo Merisi/Flickr). Vic, it’s hard to do anything halfway. We’ve all grown up with Vince Lombardi drummed into us. But maybe the French and Italians have it right. They’re all on vacation right now. Have been for weeks. Gladwell’s 10 hours per day, five days per week is probably guidance for those working at something that represents their livelihood. I’ve wondered what the corollary is for those of us who work at something as a hobby, desiring to be more proficient – in my case playing guitar, golf, etc. – but whose prime livelihoods leave us much less time for practice. Over the years I have tried to come to terms with the need to relax. A hobby is just that, a hobby. I try to keep competition out of it, play as often as I can but only when I comfortably can — it seems to make for a less stressful life. Although I disagreed with him more often than not, what I always liked about Jon Stewart is that he made it look like more fun than it was — no mean feat to make your livelihood look like a hobby. I usually fall into the trap of treating the hobby as a livelihood. Next Next post: Walkin Ova Heer…!